The photo at left of the 1903 New York Giants was removed from one of the first pictorial magazines ever published -- the Burr McIntosh Monthly. Many mistakenly refer to these photo pages as premiums, due to the heavy stock and oversized format (approx. 6 1/4" x 12"). The magazine essentially was a folio of photographs bound by a ribbon, enabling readers to easily remove individual pages for framing. This particular photo, which appeared in the magazine's first year of production, features a number of Hall of Famers. 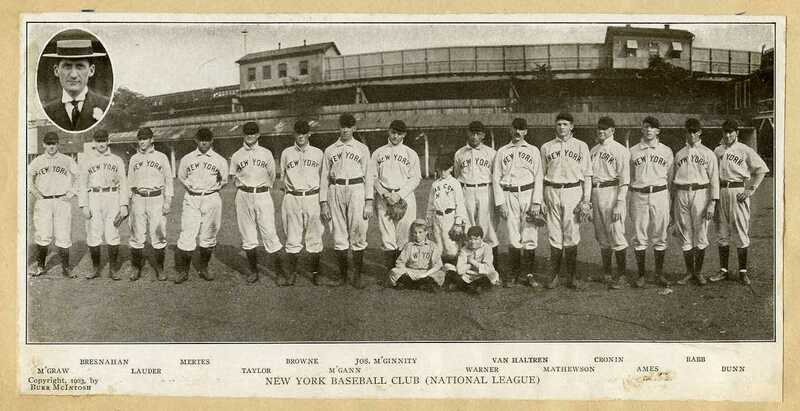 John McGraw is at far left, in his first full season managing the Giants. Roger Bresnahan and Christy Mathewson also are showcased prominently. 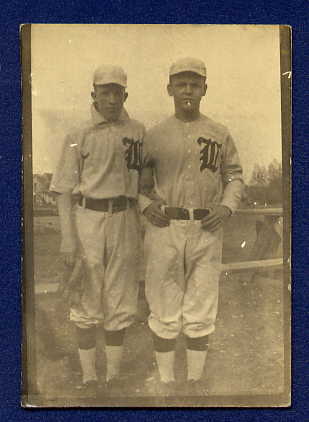 Slightly larger than a tobacco card, this small photograph on stiff stock features two ballplayers form Littleton, New Hampshire -- most likely from a local town team. A nice shot with fine uniform detailing. Unkown date. 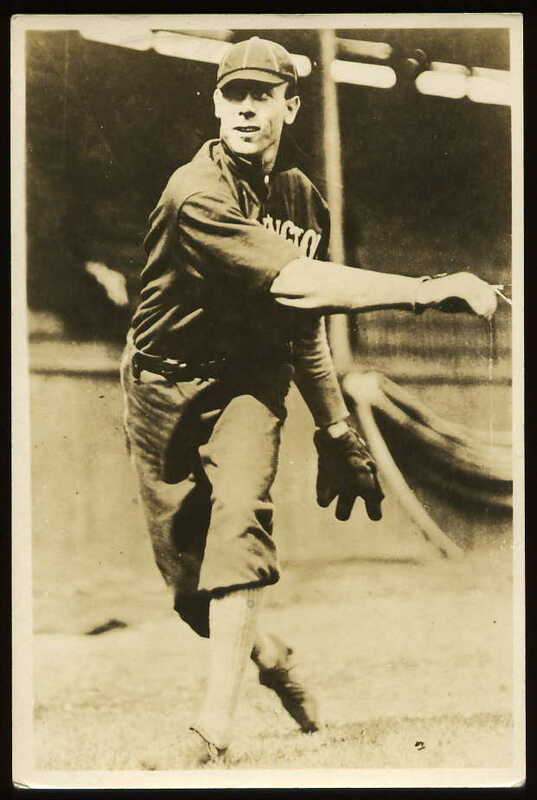 Percentages definitely are in favor of this player being identified as Stahl -- in addition to the facial resemblance to other Stahl photos, he wore a uniform similar to this one in 1903, 1909 and half of 1910 (road games). For his part, Bradley only wore a lace-up uniform in 1910 road games. However, there is one piece of evidence on favor of the Bradley identification: this cabinet photo features a player in a pose that is virtually identical to that of Bradley as captured on his T207 baseball card ( click here to see this card ). Bradley's career was distinguidshed when he became the first to hit a home run over the left field wall in Fenway Park, on April 26, 1912. Stahl served as a player and manager for the Sox and the Washington Senators, as well as a player for the NY Highlanders . A great close-up of him can be seen on his 1904 Sporting Life Cabinet card ( click here to see this card ). This top quality cabinet photo has been preserved in its own folio (complete with tissue paper insert). Interestingly, this subject has been identified differently by two different previous owners. Definitely depicting a Boston Red Sox player, this ballplayer has been identified alternatively as Jake Stahl and Hugh Bradley. The Stahl identification was performed by two baseball researchers in 2002, while the Bradley identification was provided by a previous owner, many years earlier. This c.1900s photo is not mounted and measures approx. 5 x 7 inches. 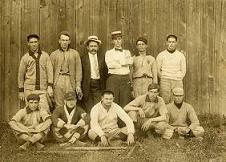 Almost definitely showcasing a town team, this sepia image features nine uniformed players and two club "officials" posed in front of a wooden fence or building wall. The player uniforms feature a 'W' on the jerseys (with one player also boasting the letter 'S' on his cap). Bats and gloves can be seen in the grass. As always, any info would be appreciated! in 1908 through 1913 as player-manager, while Hugh Frederick "Corns" Bradley played for the team from 1910 to 1912. 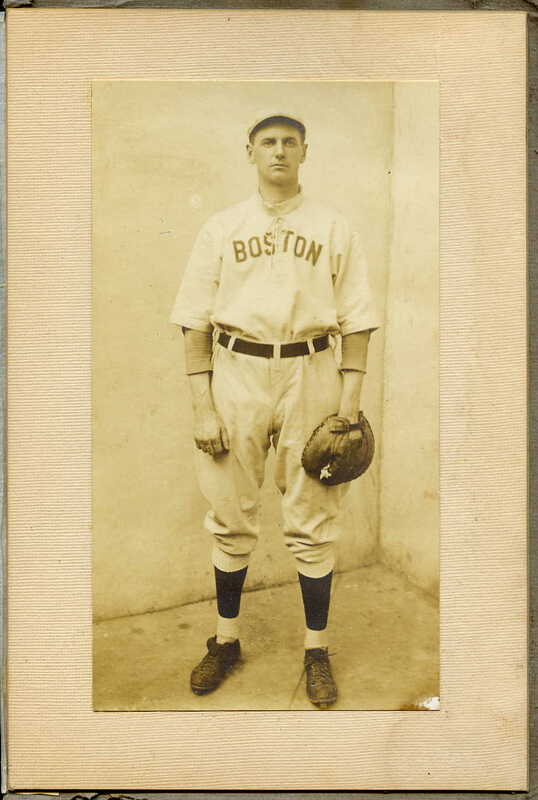 Significantly, this player's uniform is consistant with Boston's home and road garb in 1903 and 1909 and with their road uniforms in 1910, according to Mark Okkonen's Baseball Uniforms of the 20th Century. 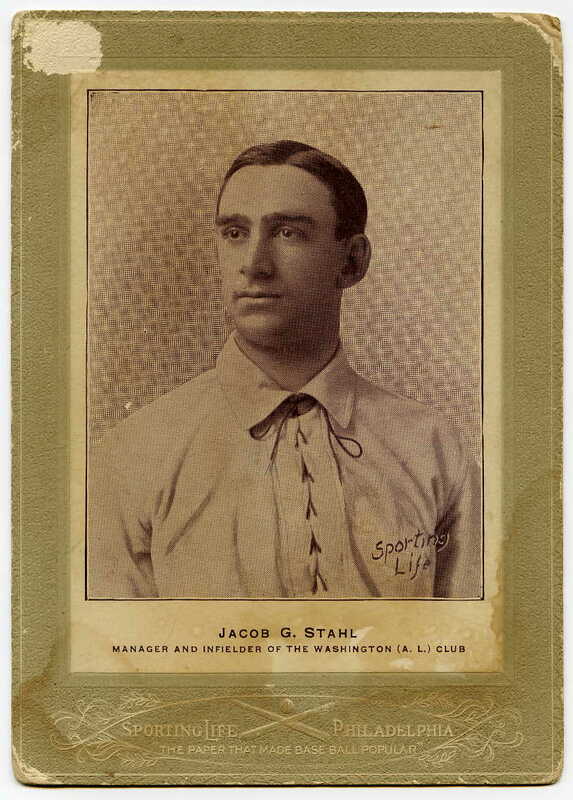 The jerrsey is of the lace-up variety and the glove is that of a first baseman or catcher (most likely frst baseman, as it is in keeping with another Stahl has been photographed wearing). Both Stahl and Bradley played games at both the first base and catcher postions, however! 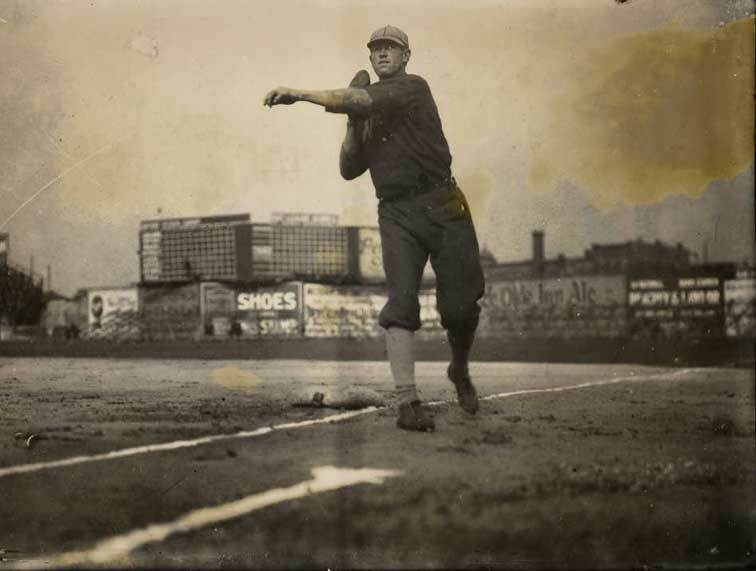 This in-action photo of Hal Chase, was most likely taken in 1906, as this was the only year during Prince Hal's career that the NY Highlanders wore these uniforms with dark material and grey socks. This specimen is a later generation print of this unique pose of the infamous Chase. Like "Tubby" Spencer, himself, this 1908 cabinet card featuring the catcher is similarly oversized. Weighing-in at approximately 10 x 13 inches, this photo depicts the backup backstop with amazing clarity. This piece was once framed many, many years ago with markings on the reverse from the nails which once held this photograph in place in its frame. 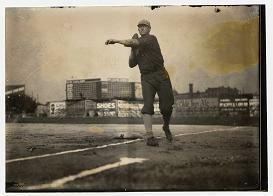 Edward Russell Spencer is shown here in his 1908 Browns uniform -- his last of four years with the St. Louis ballclub. He played for the Red Sox in 1909 and the Phillies in 1911, before dropping out of sight until 1916, when he rejoined baseball with the Detroit Tigers, finally hanging up his shinguards at the end of the 1918 season. Click on either photo in this box to be taken to a page of photographs featuring the 1908 Brooklyn Dodgers and their star hurler, Nap Rucker. This postcard-sized photograph was one of many in a find of photos featuring either the George Burke or Burke and [George] Brace stamps on the reverse. This example from the celebrated Chicago photographers captures Washington Senators pitcher, Bob Groom, in his rookie season of 1909 and is most likely a 1930s-generationa print. Groom, who is seen here in his road uniform, set a major league record that year by failing to notch a win from June 19th through September 25th, piling up 19 consecutive losses to end the season with a 7-26 record (a tally which tied the AL record for most losses ina single year). He eventually went on to a 24 win season in 1912, followed by a stint in the Federal League. He even pitched a no-hitter in 1917 while with the Browns, ending his career the following season in Cleveland...with a "grand" total of 119 wins and 150 losses.